Hi I'm Nicola from www.thewonkyspatula.com, I am on a mission to show you the tasty way to be healthy. I’m passionate about teaching people how to feed themselves healthy, wholesome and nutritious food, taking them on a journey to a healthier lifestyle. Be sure to check out my recipes every Wednesday! 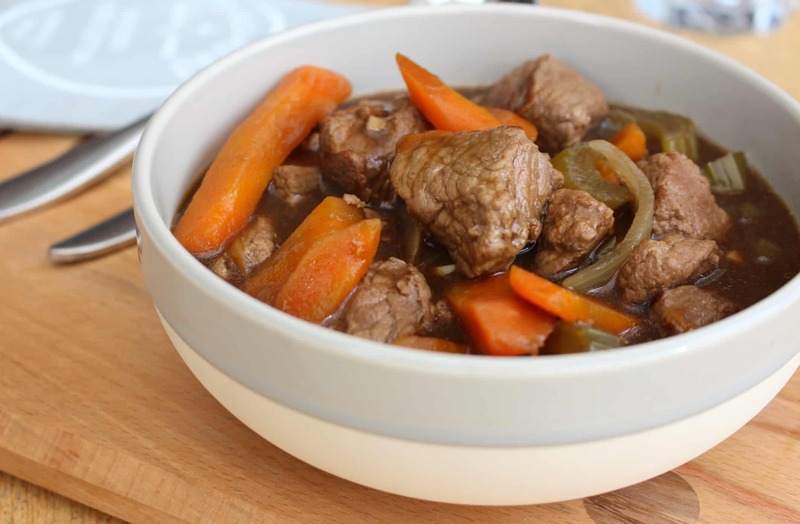 Beef and Guinness Stew – The perfect one-pot meal to curl up on the couch with! Nicola here from The Wonky Spatula with another Irish recipe this week I’m sharing Beef & Guinness Stew, I love nothing more during the colder months than coming home to a comforting meal. This is the perfect recipe for your slow cooker/crockpot. If you love these Irish recipes we send them weekly straight to your inbox on our weekly dose of Irish, sign up here. Total comfort in a bowl! Heat some oil in a large pot and brown the meat in two batches with a pinch of coarse salt. Remove and add to your slow cooker. Add another dash of oil to the pan and fry off the onion, carrots and celery, along with the garlic before adding to your slow cooker. Pour in the Guinness, and enough stock so that everything is nicely covered in liquid then add the bay leaf and season to taste. Cook gently on medium for about 6-8 hours until the liquid has reduced and the meat is tender. I love serving mine as is in a large bowl! You can team yours with some floury potatoes! My mum’s top tip: If the sauce isn’t thick enough strain the juices into a small saucepan. Mix with some Bisto over a low heat until thickened before adding it back to the rest of the stew! If you try out this recipe let us know in the comments below. Keep an eye out for my new Irish recipe next Wednesday and in the meantime, you can follow along with what I get up to over on Instagram, Facebook and my website. P.S Get your weekly dose of Irish straight to your inbox for free sign up here.